Ike is 4.5 years old, youngest of four kids. He is our blondest child, almost red headed. His face gets extremely red very quickly when he plays outside - enough that you'd think something was wrong with him. Ike was a preemie (34 weeks) but a healthy baby, slept great, walked at 17 months, developmentally delayed just enough for a preemie, with the exception of speech. He has a serious speech delay. he began Early Childhood Intervention at age 2 and at age 3 he tested in the 11th percentile for speech, both articulation and language, and therefore qualified for an intensive speech therapy preschool 4 hours a week called PALS with our school district. He attends Tues and Thus afternoons. Ike also attends preschool Mon-Thurs from 9-1. He is immature, seems about six months younger than his age, but has always had a steady progression in development so I have not been concerned other than his language. The only significant thing about him is allergies. None of his siblings have allergies except for his sister who gets excema from dogs and cats. He was allergic to cows milk as an infant, it made him scream, so I put him on soy formula, but he was constantly snot nosed with occasional rashes. We evacuated to Temple, Texas for Hurricane Ike when he was about 18 months old, and the snot was gone. His disposition changed too, he was much happier. I realized he was probably constantly feeling like crap too. :( Once we were back in Houston the snot came back. I had him prick tested by an allergist and it showed nothing, but I took him off cows' milk (but not all dairy) and the snot decreased significantly. Until recently anytime he drank cows milk he would get snotty again. He began preschool at age 2.5 two days a week and did fine that year. Right around his fourth birthday his teacher began to report serious behavior issues: he would make inappropriate noises, act defiant. He also showed zero interest in potty training. This is also when his face began to get so red when he went outside. I did not like the way the teacher responded to him so I moved him to a new school with a much more experienced teacher. She potty trained him and he did okay once he realized she was firm. He was at this school about 8 weeks. That summer he stayed home and while he is strong willed and can be a pill, I have not considered him an exceptionally difficult kid. We began to think that we had spoiled him, as he is the baby, and both Walker and I made an effort to be much more consistent in our discipline and (me) to not baby him so much. The behavior improved somewhat but he would still have difficult days. At VBS and in Sunday School at church, there were no serious issues. This past August, he began a new school year and had trouble from the beginning - he did not want to go to school to begin with, and once there, was constantly getting in trouble. He would often freeze and stare when the teachers asked him to do something (he does that to us too.) The school also wanted him to nap for two hours and during that time he would cause trouble. I didn't feel like they were handling the situation well and he was miserable, so we left that school after two weeks, at the beginning of September, and moved to another. At first he loved his new school. The only issues the teacher mentioned were that he did not want to sit on the plastic circle in music class, so she thought he might have a sensory processing disorder and be sensory averse, but I have not seen any other evidence of that at home - if anything, he is a slight sensory seeker. On October 19 I had his parent teacher conference, and there were no major issues to discuss. Sometime after this - perhaps Halloween? Things went downhill fast. Every day I began hearing that he was having trouble at school. He was being increasingly defiant, not obeying his teacher, making inappropriate noises, shouting, and escalated to him hitting other children for no apparent reason. At home he is defiant - he will just stare when asked to do something or say NO outright. He is repetitive, demanding his way always. He must be the center of attention, unless he is alone with just me, in which case he usually acts just fine. He has become very aggressive to the other children, kicking, scratching, hitting, pulling hair. He has also broken several of my things, including cutting the antlers off of a brass planter with deer heads on it (which I loved!). Boys are destructive - but he should be and had been growing out of this, but in the past month it has gotten worse. He has had trouble at Sunday School too, crying when being left, which is new, and being disobedient to his teachers. Around the beginning of November he chewed holes in two of his shirts, so badly that I had to throw one away. I fussed at him and he didn't do it again. Discipline is not working. We've tried it all and seen minimal improvement.The only thing that slightly works is daddy spankings but of course he is not here much of the time. Over Thanksgiving, he had lots of junk food, including Cheetoes, red Hawaiian punch, and honey buns. The Monday after we returned from Galveston, he was awful. Light bulb moment: I began to wonder if there were a correlation between the junk food, especially the red dye in the Hawaiian punch, and his behavior. November 29, he was the worst I have ever seen him. Completely defiant to me in the morning and very hyper. For the first time, I began to realize that maybe this is the way that he had acted at school. He had a very bad day at school - hit one child with his coat, and then ran and pushed another child over for no apparent reason on the playground. After we picked up the other kids we went to Kinko's to get our Jesse tree book printed. He was bouncing off the walls, climbing on the furniture in Kinkos - he was one of those kids you see in public and think the parents never discipline him. Later that evening, I found that he had snuck a packet of hot chocolate mix in his room and had mixed it with water that morning before school. When I spanked him for stealing food (this has been an ongoing problem) he laughed and said, "That tickles." Once again - lightbulb - artificial ingredients in the hot cocoa --> horrific behavior. I began researching the Feingold diet and began shopping, gradually eliminating the things in our home that contained banned ingredients while I waited for the packet to arrive. Friday, December 2: I was supposed to read to Shep's 2nd grade class. Ike was out of control. He ran all up and down the halls, laughing maniacally. When I was reading, he could not sit still - demanded to be in front of the class with me, and did everything he could to get attention. I had to interrupt my reading at least 4 times to deal with him. Absolutely no response to discipline. It was awful. We started full on Feingold on December 5. Oh, Missy! This sounds just awful! Praying for y'all - that God will continue to give you wisdom to know what to do. You are a strong, smart Mama for taking on a total re-vamp of your family's eating habits. Hugs to you!!! (sorry if you get this comment twice, I hit a button and the last one disappeared:) have you had Ike evaluated by a private PT/OT who specializes in SPD? 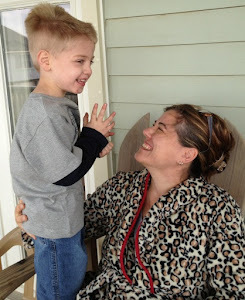 We worked with ECI for a year and they never picked up on Judah's issues with SPD....the "spazzing out" and the shirt chewing, inability to control himself in stressful situations, being loud...it just really sounds like he could have this disorder. A few things that stumped me: SPD kids can have inconsistent behaviors; also, they don't have to have ALL the signs to really need help: just one! I hope you dont mind me asking these questions...my heart hurts for you and I will be praying for Ike--I know how you feel!!! One more thought: (can you tell I can't sleep tonight? ;)It just seems like he is trying to gain control of his little world when he shouts, hits, refuses to comply or obey...he may be frightened and going into a type of fight or flight mode...have you noticed if he does better after a day of physical exertion? Sorry to keep harping...like I said before, I am praying for you all, and I know it can be SUPER annoying when people give unwanted advice!!!! Sounds like one, and maybe two, of my kids. After reading what you wrote on your Naptime blog, I decided to go back to the organic section of the grocery store. Thanks for sharing this blog. We have a mutual friend, Brooke M., and she told me about your blog! Do the Feingold 100% and you will be amazed around week 7 of the diet. Around week 3, 4 or 5 your child may hit detox and the behavior gets worse before it's better. It totally works though! My daughter is the same age and has SPD as well. It wasn't until we did the FG diet that I could distinguish between her food reactions and her SPD. She's not totally "cured" but she now can sit, focus, communicate, use her imagination for much longer periods of time. She no longer has a tick (blinking her eyes). We've done a little OT for the SPD and brushing but I need to start being more consistent with the brushing. You can Youtube brushing to see what I'm referring to. Good luck with the diet. Definitely do it 100%. Both of my sons deal with sensory processing disorder and one of the falls on the Autism spectrum. I have have read SO many books and just want to suggest one to you. A sensory seeking child (one of my sons) still deals with similar challenges. She has another book FULL of things you can do for each sense, which is SO good, but this book changed everything for me and I wonder if it could answer some of your concerns. I can relate with alot of what you've wrote. We do a very organic/whole food diet and I have seen dramatic changes, on top of a sensory filled diet. Please, please, pretty please consider laying off the spankings. By your own admission, it doesn't help much and "daddy spankings" only help a little. Establishing a disciplinary relationship like that isn't ideal and in the end, will only breed resentment. Kids resent their parents for always spanking them and the parents resent that the spankings aren't working--and often tend to start hitting harder and more frequently in an effort to make it work. I would hope you wouldn't spank your kiddo if he was getting chemo and vomited on the floor after you told him to vomit in the toilet. What's going into his body is causing an adverse reaction beyond his control and no amount of spanking cures that. Thanks Lena, but being that I don't even know you, I won't be relying on you for advice on disciplining my kids. Toodles! It was just a random thought, that's all. :) I just felt sad thinking about how hard it must be for him to feel so out of control and possibly having his body and emotions do things (like acting out) even if it's not necessarily what he wants to do, on top of the challenge of trying to appropriately communicate it. Overcoming things going on at a cellular level is hard, especially for kiddos--diabetes, food allergies, autism, medical conditions, etc. all cause different reactions in different people and so often kids just feel bad and aren't great at expressing it. I hope you have some luck with this diet for him. One of the families I volunteer with has had some success with a modified version in managing their teen son's seizures and there are lots of other success stories, too. Good luck!